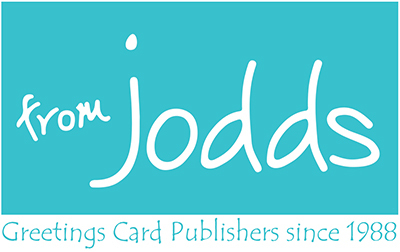 www.joddscards.com is the website address for Jodds, PO Box 353, Bicester, Oxon OX27 0GS (hereafter referred to as “the Company”, “JODDS” “we” “our” or “us”). All use of the Company’s website (“the Website”) is on the terms set out below and the terms apply to all pages of www.joddscards.com. If you do not agree with any of these terms then please cease use of the Website now. By placing an order with us you are agreeing to be bound by these terms and conditions which form a contract between us so you are advised to print off a copy for future reference. We reserve the right to change the terms from time to time to meet the needs of the business. Access to this Website may be restricted, suspended or terminated at any time. Please remember that if you use the Website you are responsible for maintaining the confidentiality of your account and any passwords and should ensure you restrict access to your computer to prevent unauthorised access to your account. You must inform us immediately if you have any reason to believe that your password has become known to anyone else or if it may be being used in any unauthorised manner. We make every effort to ensure that the Website is accurate and up-to-date with current products and services. Please ensure you check independently on any information before you rely on it. Whilst we do our utmost to ensure information is correct at the time of posting on the Website no representations are made by us that all information is accurate, up-to-date and complete and we shall not be liable in any way for any loss or damage arising from any inaccuracy in any information or information which is out of date. We take every care to ensure that the descriptions and specifications of our products are correct. However, specifications and descriptions of products on the Website are not intended to be binding and are intended only to give a general description of the products. Furthermore, while the colour reproduction of the products is a close representation, we cannot accept any responsibility for any variation in colour caused by the browser software or computer system or screen used to view the products. We reserve the right to refuse access to the Website, to terminate customer accounts, to remove or edit Website content or to cancel any orders if necessary. In the event the Company cancels an order it will be without charge to you. You must ensure your PayPal Account shows the correct and current address. Please make sure your delivery address is given in full with a correct postal code. Please make sure you provide us with the correct e-mail address and ensure that your e-mail is in full working order. We will send you a confirmation email on receipt of your order which will confirm details and acceptance of your order and contract with us. We will also send you an email following dispatch of your order. Please note that all products and services are subject to availability and may be withdrawn at any time. We reserve the right to refuse any order. If we are unable to fulfill your order we will notify you with an option of waiting for the product to become available or to be refunded in full for the product which is unavailable. The Company shall not be liable for any problems caused by you supplying faulty information (such as the wrong email address or wrong delivery address or inaccurate information) or due to your failure to make any particular request or specification. It is the responsibility of the customer to notify JODDS immediately if there are any delivery problems or if the goods ordered are unfit for purpose, not as described on the Website or not of satisfactory quality. All products (and postage and packaging where applicable) must be paid for in full prior to the dispatch of goods ordered unless agreed in writing. Once an order has been placed, it may not be cancelled without due cause. The Price of the Goods shall be the price quoted or displayed on the Website at the time your order is accepted. We try to ensure that all details including prices are displayed accurately and are to date. Obviously prices may vary from time to time so please make sure you check all the relevant details before you place an order with us as prices may have altered since you last visited our site. All prices are in pounds sterling and are inclusive of VAT. If your order is being dispatched to a destination outside the EC then you will be responsible for the payment of any customs or import duties levied once the order reaches your destination country. Ownership of the goods shall not pass to you until we have received in full all sums due to us in respect of the goods supplied. The goods are at your risk from time of delivery. The delivery charges payable by you are exhibited on the Website and may vary from time to time and will vary depending on the place and method of delivery. Payment will be debited from your account before the dispatch of your purchase. We will take all reasonable care, in so far as it is within our power to do so, to keep the details of your order secure, however if we are not negligent, we cannot be held liable for any loss you may suffer, if a third party procures unauthorised access to any data you provide when accessing or ordering from our site. In the event you are entitled to a refund such refund will usually be by means of credit to the credit/debit card you paid with if that is the method of payment used. These terms of sale are subject to change without notice and are correct at time of writing. If an order is refused, or the incorrect delivery address details have been noted at the time the order was placed, or failure to respond to the calling cards left by the courier, the package will be returned to us. If the customer wishes the order to be resent, they will be asked to pay the further delivery charges. If for any circumstances beyond our control we are unable to produce an item it will be marked as “out of stock”. You may still place an order but it will only be dispatched once the item is again available. We reserve the right to withdraw any products from sale at any time. If you wish to check availability please email us at info@joddscards.com. If your order cannot be fulfilled you can either have a credit note or a full refund. In the event you fail to take delivery of the Goods ordered or fail to supply adequate instructions to facilitate delivery of the Goods we reserve the right to cancel Your order and to retain the Goods. In these circumstances we shall refund you the price paid for the Goods we are unable to deliver but we shall be entitled to retain all charges made for delivery or attempted delivery. In the event there is a problem or alleged problem with Goods ordered or delivered you agree to notify us within seven (7) working days of delivery in connection with any problem with Goods or within thirty (30) days of placement of your order in the event of non-delivery of Goods. All Website design, text, graphics, the selection and arrangement thereof and all software compilations, underlying source code, software and all other material on the Website are copyright JODDS and its affiliates or their content and technology providers and all designs, artwork, photographs and copy shall remain the property of the Company or their relevant owner. We reserve the right to take whatever legal action may be necessary against any visitor or user of this site who is found to have infringed our rights to recover all consequential losses including but not limited to recovery of all associated costs. Please note that JODDS is a member of Greeting Card Association. Any use of materials on this Website, without the prior written permission from JODDS is strictly prohibited. You may only view, print, share or download the contents of the website for personal use and for no other purposes and this includes NO COMMERCIAL USE and no changing, adapting, copying or building on of our copyright material and no production of derivative works and all posting of JODDS’s works, including on Facebook, blogs or social media must not be done without permission from the Company. Any license may be withdrawn at any time and we wish to make it abundantly clear that it is expressly prohibited without limitation to use the service or its content for any purpose that is likely to bring the Company or any of its directors, employees, sponsors, clients or associates into disrepute. We have used all reasonable endeavours ensuring the accuracy of information on the Website but provide no warranty or guarantee in respect of the information and we make no representations as to the adequacy or appropriateness of items for sale or services for your purpose. We reserve the right, at our discretion, from time to time to make changes to the information provided on this website. You are therefore, advised to check the information provided to you on the JODDS Website regularly. Any reliance that you place on the accuracy of that information is at your own risk; we do not under any circumstances guarantee the accuracy of any of the information or links provided on the site. We will not be liable under any circumstances whatsoever for any consequential, direct, indirect punitive, or special damages arising from the use of the service. You accept full responsibility for accessing any links to other websites and we shall not be liable for any products, information, advice or practices of any third parties who may be linked to this Website. All users of this Website do so at their your own risk and take full responsibility for any consequences which may arise from accessing and using the website, responding to or using the services of the advertisers links that maybe found on the Website. We shall not be responsible or liable for your use of any other websites which you may access via links within the Website. We do not control these websites and are not responsible for their content. Any such links are provided merely as a service to users of this website and their inclusion in this website does not constitute an endorsement by or affiliation with us. Any information, data or materials whatsoever which are downloaded or transmitted over the internet. We are unable to ensure the security of any information transmitted over the internet and attempts to do so are carried out at your own risk. JODDS and its associates shall not be held responsible in any way, or be liable for any damages or injury that may transpire as a result of such actions. Errors, omissions, mistakes, interruptions, deletion of e-mail or files, suspension, delays in operation transmission or service response time, termination, defects, viruses or any failure of performance with and in connection with JODDS including, without limitation those arising from communications failure, destruction due to unauthorised access of systems, programs and services, theft or acts of God. Whilst we take all reasonable steps to ensure a fast and reliable service we can not guarantee that the JODDS Website will be uninterrupted or completely error-free and we will not be responsible for any disruption, loss of or corruption of any material in transit, or loss of or corruption of material or data when downloaded onto any computer system, or that the Website is free from viruses, harmful components or any interference by unauthorised users or hackers. It is the sole responsibility of the visitor or site user to protect his or her own systems against such situations. JODDS request your name and address, email and telephone number to enable us to fulfill your order and to help us manage and maintain your records and provide you with an efficient after-sales service. We are committed to safeguarding the privacy of our website visitors. If you register your details or make a purchase you will be added to our customer database to receive future marketing material and special offers, unless you specify otherwise. JODDS will take reasonable technical and organisational precautions to prevent the loss, misuse or alteration of your personal information. We will store all the personal information you provide on our secure (password protected) servers. All electronic transactions you make to or receive from us will be encrypted. Sending information on the internet is not completely secure. Although JODDS does its best to protect your personal data, JODDS cannot guarantee the security of the data transmitted to the Website. Any transmission is at your own risk. Unless JODDS has been negligent JODDS is not liable for any loss arising from a breach of security. JODDS shall use all reasonable endeavours to complete the order as requested by the customer and as agreed by JODDS but we shall not be liable for any delays or other problems which are due to any reasons beyond our control including but not limited to flood, fire, accident, breakdown of plant or machinery or unavailability of raw materials from the usual sources of supply. All purchases made from this website shall be deemed to have been concluded in England and these terms shall be governed by the laws of England and Wales whose courts shall be the only courts of competent jurisdiction in the event of any dispute. Please be aware that once the Company has confirmed your order we will have a legally binding contract with you. JODDS’s website may be accessed from outside of the UK. Laws may differ outside of the English Jurisdiction, all visitors or users of this site from all countries, agree and acknowledge that by accessing this site they do so knowing that English Laws apply, whilst doing so visitors and users must respect, and are solely responsible for, complying with the local laws of their own territory. Also if ordering from overseas you may be subject to additional import duties, charges or taxes which may be levied once a package reaches its destination and you accept full responsibility for payment of any such additional charges.